The traditional center of Boston shopping is the pedestrian district on Washington Street	called Downtown Crossing. For most of the 20th century, two big department stores, Filene's and Jordan Marsh Co., faced one another across Summer Street, competing for customers. Filene's Basement, a separate business founded in 1908 in the subteranean levels of the Filene's store, became world famous for its price-markdown policy: the price of an item fell each week until it sold. If it didn't sell, it was donated to charity. Jordan Marsh Co. is now Macy's, a branch of the New York-founded national chain, a large department store drawing customers to a broad assortment of goods. Washington Street, the pedestrian thoroughfare of Downtown Crossing, has its own lineup of shops. Across from Macy's, at 333 and 387 Washington Street, for instance, are entrances to the Jewelers' Building, a warren of little shops in a homely building. The building may not look like much, but the display cases in each shop are laden with fortunes in gold, diamonds, rubies, and emeralds. If you're at all interested in jewelry, take a stroll through here. 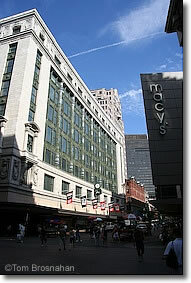 The former Filene's building faces Macy's at Downtown Crossing in Boston MA.